Composite fillings certainly are more attractive! By the time you reach adulthood, there’s a fairly good chance that you’ve received at least one filling in a tooth because of tooth decay. Yes? And the same goes for other adults you know – in fact many even have a whole mouth full of silver (amalgam) fillings! So… unless you’ve had a tooth filled recently, or know someone who has, you might not even know about the composite tooth-colored fillings we’re using today. 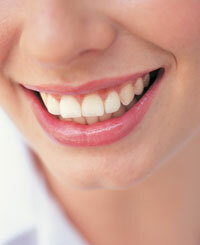 We can even replace your silver fillings with these white fillings to get rid of all that metal in your mouth! Want to know more? Give us a call, especially if you’re experiencing tooth pain that could be decay-related. We’re always happy to answer your questions. Are there certain pros and cons with regard to composite fillings vs. the traditional amalgam fillings? On the “pro” side, composite fillings are more attractive, they’re affordable, and they tend to strengthen a tooth that has been weakened by decay. On the “con” side, they usually don’t last as long as amalgam fillings, the actual procedure to fill the tooth is longer and, if you have dental insurance, they may not be covered under your contract. Amalgam fillings, although they have a longer life, are less attractive and tend to expand with age, causing the tooth to weaken and often crack. 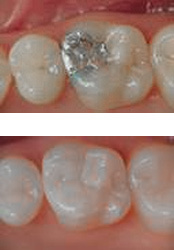 Composite (white) fillings are preferred by most patients. And What About Amalgam Concerns? There has been a lot of negative press about amalgam fillings in recent years because mercury makes up 40-50% of the amalgam filling compound. Some of the concerns are valid, particularly for people who have other conditions (i.e., pregnancy, mercury sensitivity, kidney dysfunction) or for children who need to have teeth filled. However, numerous studies have been conducted throughout various countries regarding the safety of amalgam fillings. None of these studies have found any link between the mercury in amalgam fillings and brain or nervous system functioning, adding to the growing body of evidence that amalgam is still a safe and effective way to treat teeth that have been affected by tooth decay or trauma. … and we will provide you with all the information you need to make an informed decision about your choice of dental filling material and/or replacing existing amalgam fillings with composite fillings. We stay on top of the latest research in all areas of dentistry and would be pleased to address any of your dental concerns. Please feel free to give us a call about this or any other dental concern. We’re always ready, willing and eager to serve you!